Following an initiation test to steal a priceless Faberge egg, Kit Marlowe finds himself enrolled in a spy school for the descendants of famous families, based in the heart of London. It turns out his father's `office job' is a cover - he's actually a spy - and Kit's whole family have been lying to him about their past. As the school term starts, Kit joins his friends - Abigail Newton, Max Faraday, Eddie Austen and Leila Wedgewood - to learn all there is to know about espionage. His language skills may be unparallelled, but can he pass cryptanalysis, camouflage, hacking and forgery lessons? And as if school wasn't interesting enough, Kit manages to fall foul of a Russian oligarch, Mikhail Pasternak, after stealing a vial of Doomsday bugs which was hidden inside the jewel Kit was forced to steal. When Kit learns that Pasternak plans to indoctrinate leading figures from around the world to create a legion of death, he chooses to thwart the Russian and pits himself against a very dangerous and frightening adversary. In a thrilling climax, Kit faces Russian assassins that have broken into the school looking for Kit and the bugs. C A Lockwood's debut novel takes a light-hearted and humorous look at the perils of being a not-so-normal teenager. 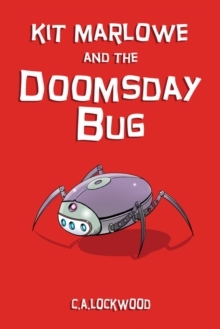 Taking inspiration from Jonathan Stroud's Lockwood and Co. novels and Anthony Horowitz's Alex Rider series, The Doomsday Bug is the first of a trilogy of fast-paced thrillers that will appeal to readers aged 12 years and older.